‘You have to drink more,’ Margaret reminds me while I sit, clasping my aching head between my hands, in our tent at Interim Base Camp (5800 meters) several days after the Junkies’ team’s arrival at the foot of Everest. 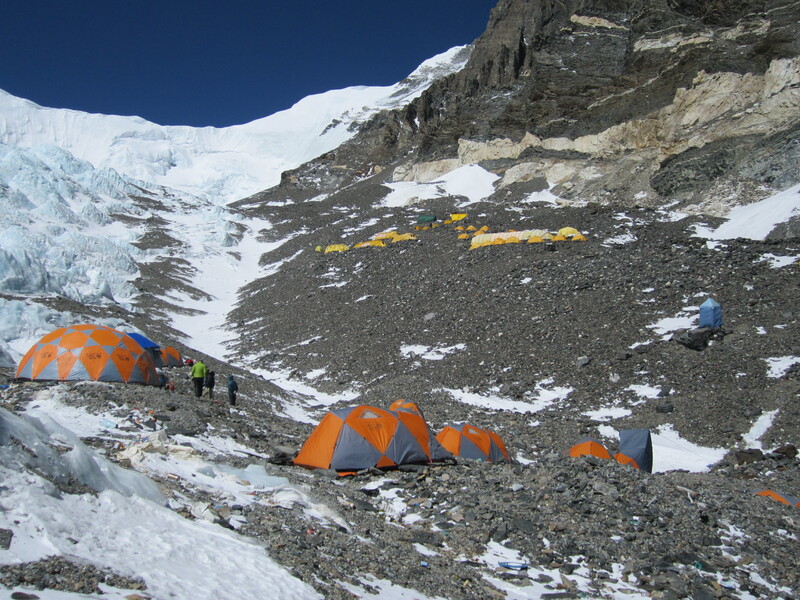 We are now headed for Advanced Base Camp (ABC, 6400 meters) to do the first acclimatization rotation on the mountain. In the course of the rotation we are meant to spend several days and nights at ABC and climb to 7050 meters – Camp 1 on the North Col. However, at the moment I can’t see myself going any higher. ‘Just keep drinking,’ Margaret insists and I try to drown the nauseous feeling in my stomach in another large gulp of boiled water. When you wake up and see your dream in front of you, it makes for a good morning, doesn’t it? 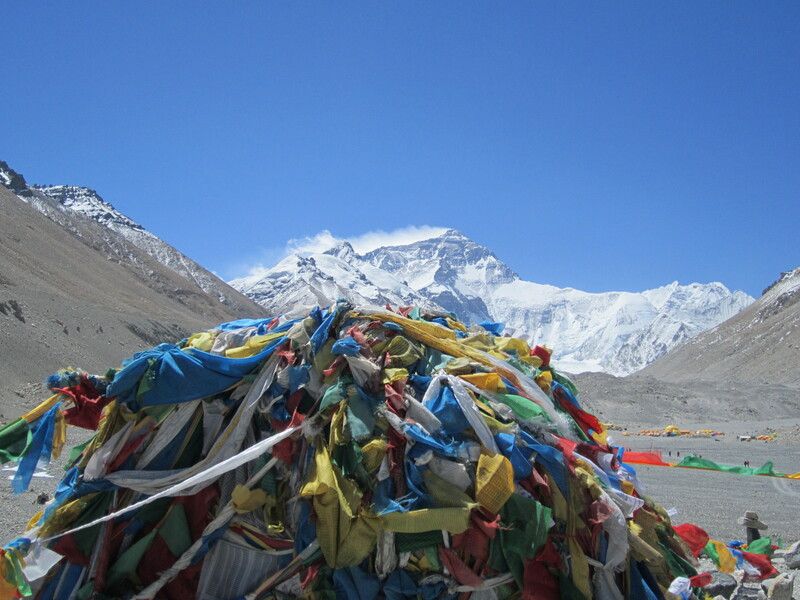 At Everest Base Camp I would wake up to the sight of my elusive goal for a week after we arrived. Between our arrival and the departure for ABC we had a very entertaining puja ceremony to bless our team’s passage on Everest and to celebrate the start of the expedition with (quite) a few drinks. 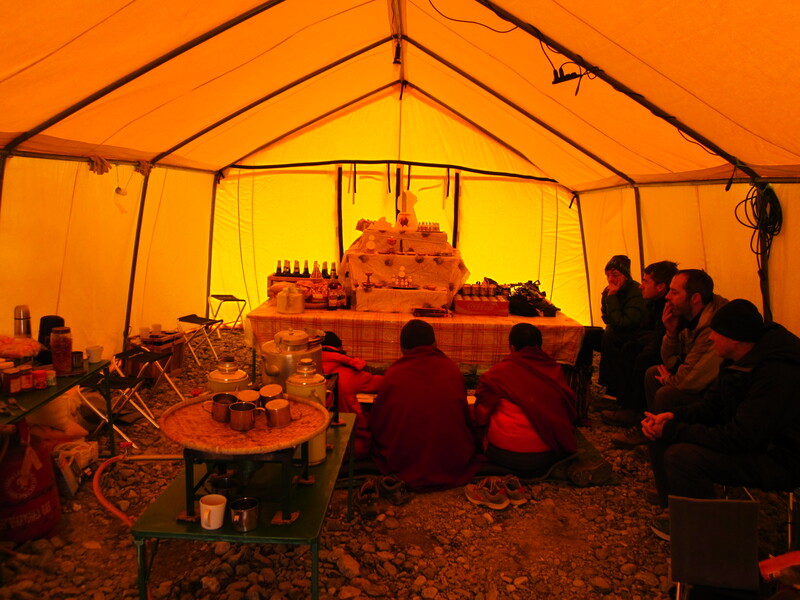 I had no trouble during the first part of the puja, when three lamas from Rongbuk Monastery recited mantras for us, but I did struggle when the time came to start ‘celebrating’. After enjoying some beer and rakshi, the team members and the Sherpas began to demonstrate various feats of flexibility and craziness: splits, headstands, ‘ice-screw’ and every other imaginable kind of dancing… I was lost – I don’t drink, after all. ‘Mila, you write poems, right? Why don’t you read us one?’ Unable to get out of it, I chose to recite ‘For Me’ and, thus, was spared having to drink beer while simultaneously doing pirouettes. After the celebration only five of the Junkies’ team of seven made it to dinner; perhaps, three or four of us actually realized they were in the dining dome at base camp in China and not in a glass palace in Tuborgland. Thus, the fun and funny puja day came to an end for the team over/in a plate of yummy momos, prepared by our awesome cook Da Pasang. The rest of the days at BC were spent in trivial activities: blogging (for those of us who were able to find a way around the BGANs not working), showers, laundry, reading, walking around BC, eating, drinking and even watching bits and pieces of ‘An Idiot Abroad’ and ‘Cowboys and Aliens’ on the big screen in the Movie Tent (which became Laundry Tent later in the expedition). 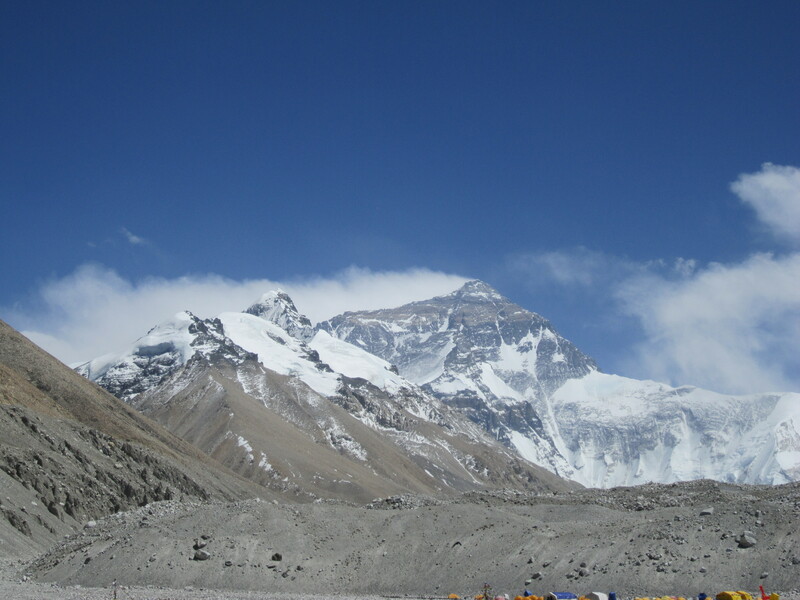 Thus, when on the 21st of April the time came for the team to leave on our first rotation, I was very excited – we were getting closer to Chomolungma at last! Little did I know that the trek to ABC along the Miracle Highway would be so painful and desperate. After walking on the windy, dusty trail to Interim Camp for 3.5 hours I am shattered. I’d walked too fast for no good reason, and must now pay for not being more careful.The drilling headache, caused by the rapid gain in altitude and exacerbated by dehydration make me doubt whether or not I can get to ABC the next day. ‘We’re already halfway,’ Margaret says, trying to help me see the bright side. ‘Drink, rest – you’ll be fine tomorrow.’ I zip up my sleeping bag and pray that she may be right. In the morning I am feeling better. The headache, although less strong, is still there, but 400mg of Ibuprofen with coffee take care of it, and I feel I can continue on to ABC. I walk with Margaret following the rubbly trail on top of the moraine cutting through tall and sharp pinnacles of ice. The snaking path seems endless, and it takes me over five hours to make it to ABC. I am neither the first nor the last to stumble into our ABC dining dome upon arrival, and I see that the two team members already seated there are no less exhausted than I am. Soon, the other Junkies make it to the dome, and we try to have some dinner – an obligation and not at all a pleasure at high altitude. The infamous North Side wind is still too strong for us to go any higher as it is early in the season, and the jet stream is still too close to the mountain. 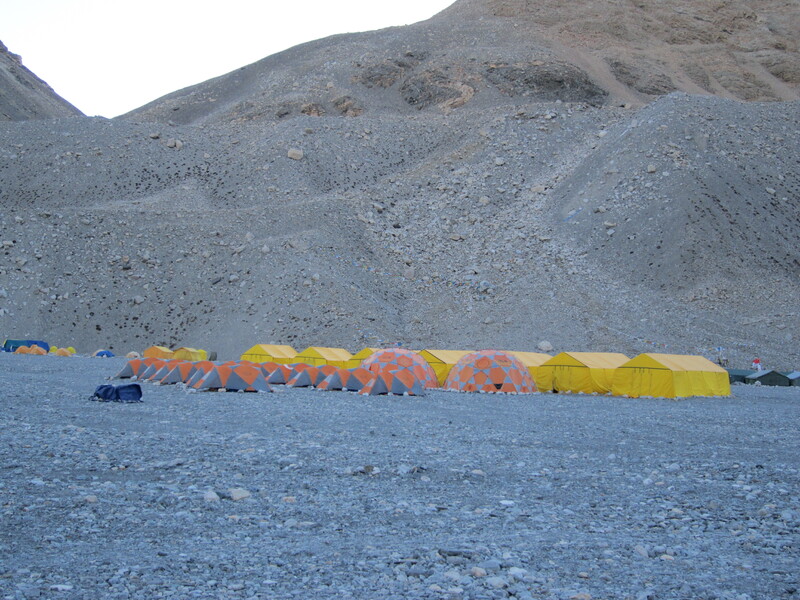 We spend several cold, sleepless nights and blurry days at ABC before we leave for the North Col on the 26th of April. It is a very windy day but we cannot afford to wait for the perfect weather any longer. 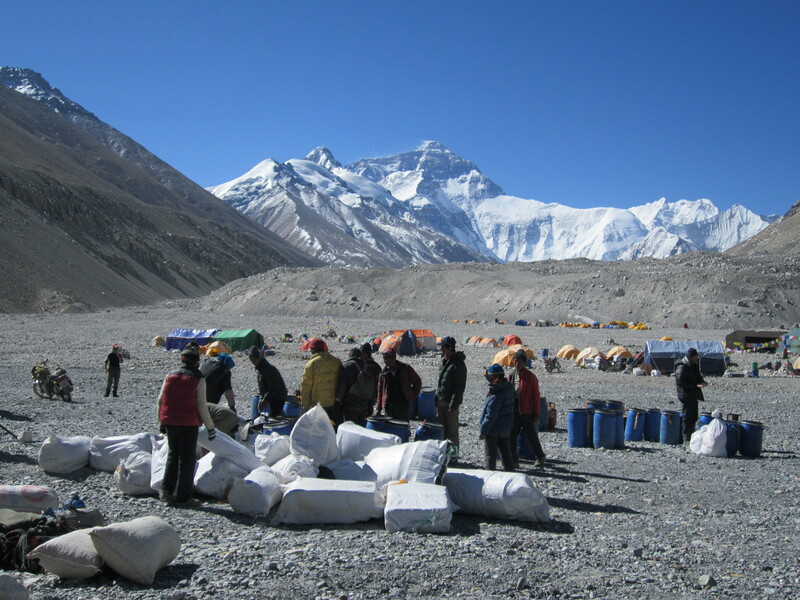 Our team of Sherpas has already started carrying loads to the North Col, and it’s high time we followed them. 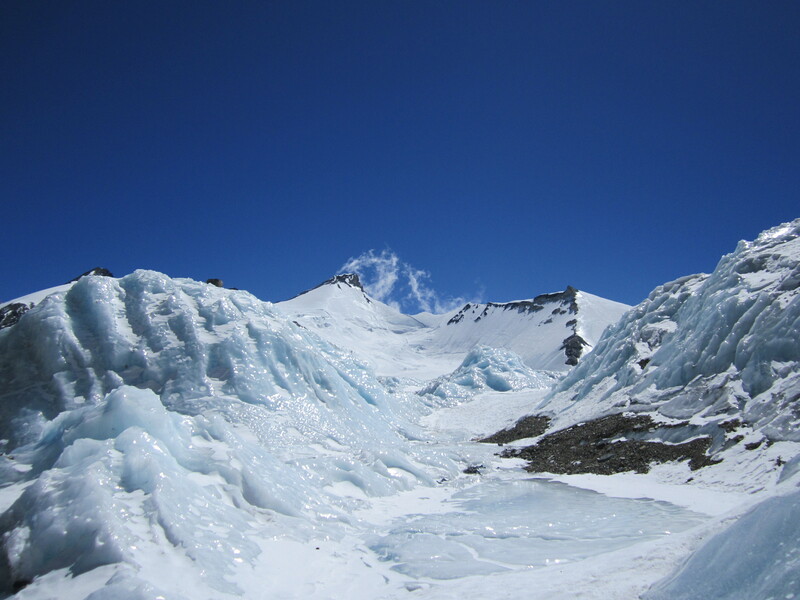 Having learnt my lesson on the way to Interin Camp, I walk to Crampon Point slowly, conserving energy, but it’s hard to restrain myself – the moment I put the crampons on my 8000-meter boots and exchange my ‘walking stick’ (trekking pole) for the ice axe, I want to run to the mountain which I have been dreaming to climb on. When I reach the first of the fixed ropes, guiding climbers to Camp 1 on the Col, and clip in, I feel happy… but very cold: the wind has already drained my body of its reserves of warmth. 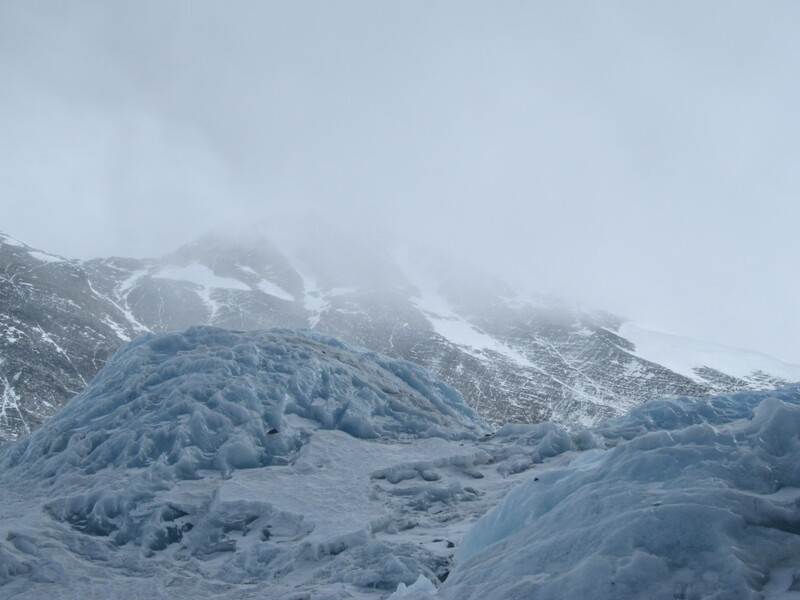 As we climb higher, I get colder and colder, having to stop often to massage my hands, which are freezing. When I see Phil, our leader, coming down, he tells me and Mark Horrell, whom I am climbing with, that the Col is very close but outrageously windy. Thus, once Mark and I get to the top of the steep section where we met Phil, I decide to turn back: we are now 100 vertical meters away from our target elevation, and I won’t risk getting frostbite just to say ‘I made it all the way to Camp 1’. As I descend the steep slopes through the ruthless white wind, following the expedition sirdar and my good friend Dorjee, I realize I’d made the right decision: I did not have those 100 meters in me, neither in warmth, nor in energy. Back in my tent at ABC I cough and cough forever – the wind has chilled me inside and out, and I worry that my immune system, weakened by the recent illness, will not be able to shake off the cold. 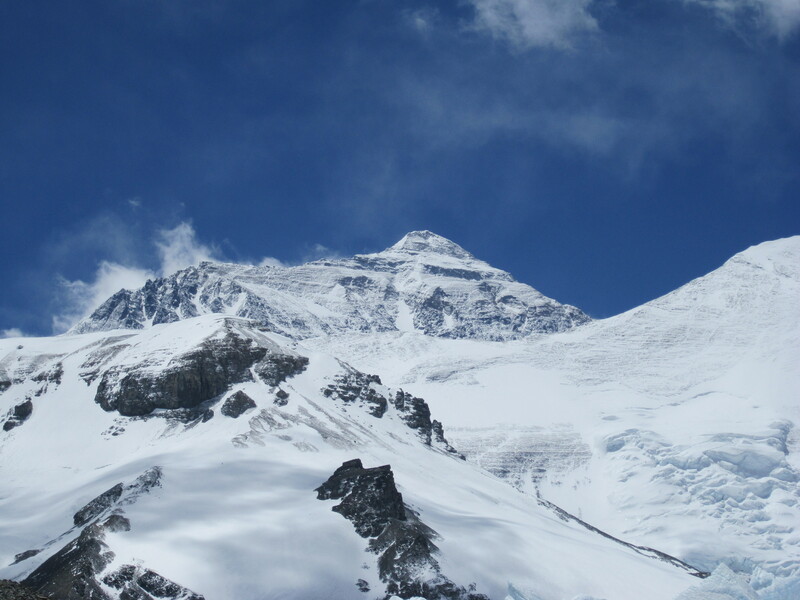 Yet, I feel great – I’d climbed on Chomolungma, and it was a beautiful experience! The border crossing in Kodari distracts me from these grim thoughts. Our team’s 250 porters, mixing with other travelers, cross the Friendship Bridge, and we follow the group tents, chairs and gear into China. The rigorous border checks take a while, but go smoothly enough, and early in the afternoon we find ourselves already in Zhangmu, having lunch before proceeding to Nyalam at 3800 meters. The scenery as we drive higher into the mountains is stunning: the still cold, bare hills rise above grey gorges, linking the dry earth to the heavy clouds in the sky. 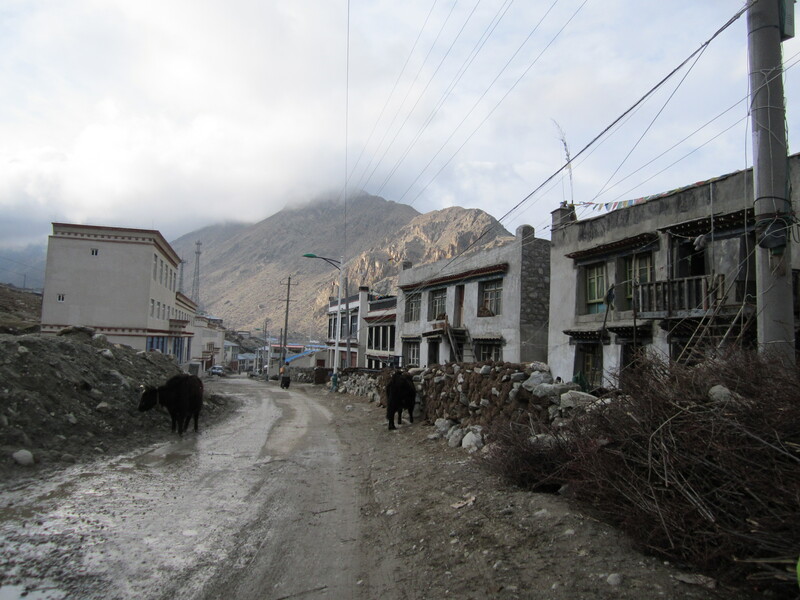 In about two hours we arrive in Nyalam and, following its main street, down which thick steam pours from pipes, sticking out of every window, we arrive at our CTMA-assigned accommodation. We will spend two nights in Nyalam – to acclimatize to high altitude. I will be in bed most of the time, shivering with fever, or cold, or anger at myself, I hardly know. 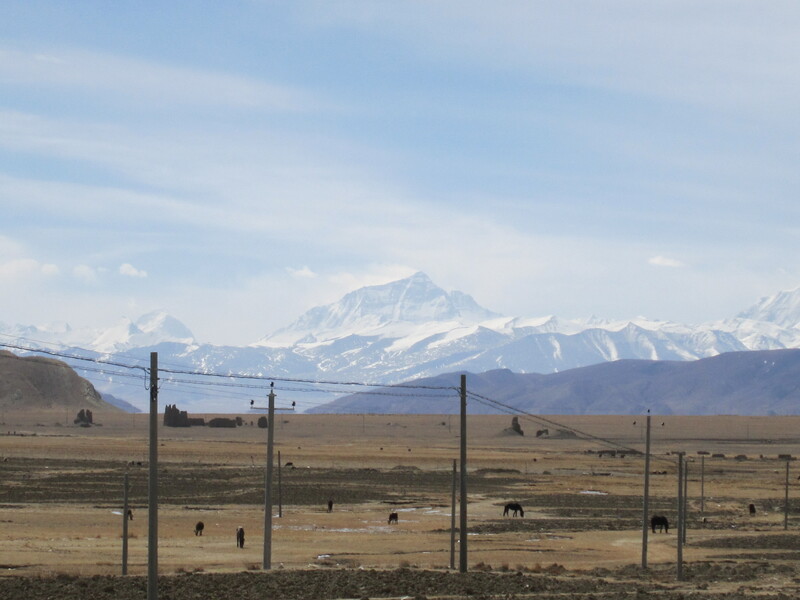 On the 12th of April we leave for Tingri at 4300 meters, where we spend two more nights. The scenic drive through the Tibetan high-altitude desert takes us across two high mountain passes of over 5000 meters in elevation. 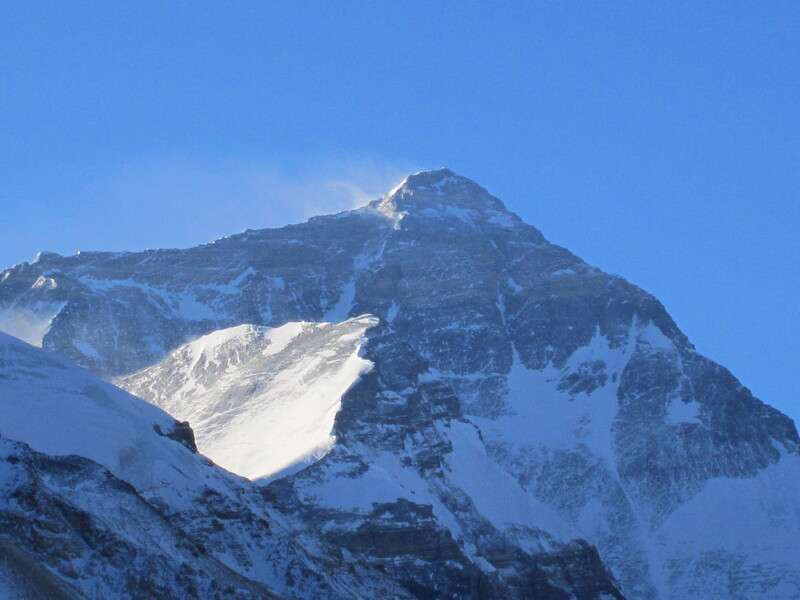 It is on the way to Tingri where we catch our first glimpse of Everest. Blurry in the distance, it rises above the valley, completely surreal: broad, black, tall, intimidating. Looking at the summit, battered by the powerful jet stream, I ask myself: ‘what was I thinking?’ Everest is just too big a dream! 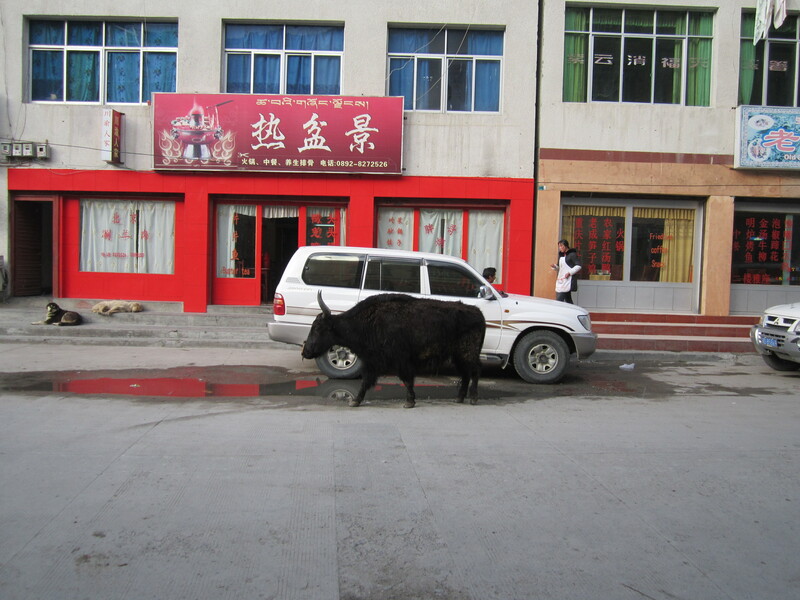 In Tingri the Wild-West-looking town’s dogs, famous for biting and sending home many a hopeful Everest climber, keep me and my team mates confined to the grounds of the hotel. Still sick, I watch movies and nibble on Chinese candy with the wonderful and inspiring Margaret Watroba, a well-known mountaineer/electrical engineer/Wonder Woman from Perth, Australia, who summited Everest from the South/Nepal Side in 2011. We go through liters and liters of ginger tea, trying to fend off the headaches caused by the rapid altitude gain of the past couple of days. I am excited to be climbing alongside Margaret: she was the one who made me believe I could do it – climb Everest – in the first place, and her presence on the team is a great joy and comfort to me. 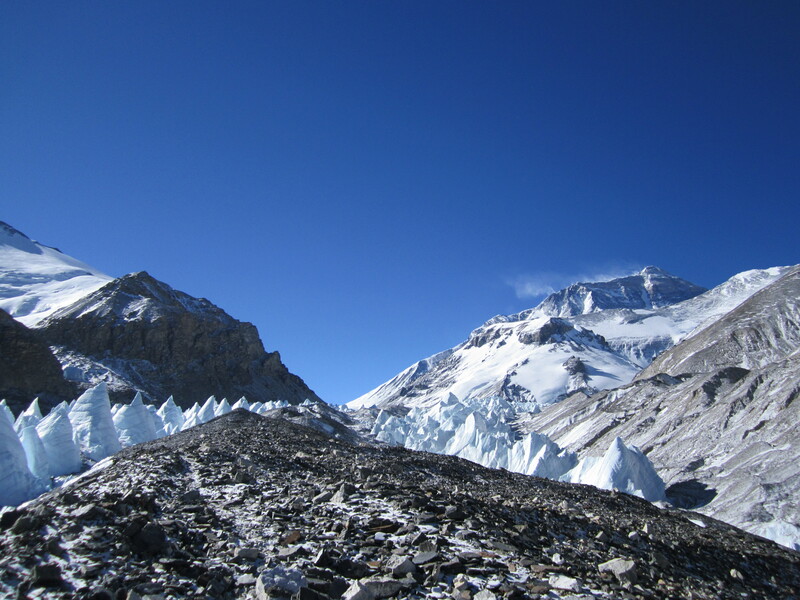 On the 14th of April we arrive at Everest Base Camp (BC) after a four-hour drive from Tingri. The base camp area is very spacious, with different teams’ headquarters located at a good distance from each other. As I later find out from a team mate, Grant Rawlinson (http://climbforhope.wordpress.com/), there are about 110 injis (westerners) on the North Side of the mountain – not too many at all compared to the infamously crowded South Side. While our leader, Phil Crampton, and the Sherpas get quickly to work on the group and individual tents and the dining and communications domes, we sip milk tea in the kitchen tent, popping our heads out occasionally to look at Chomolungma, who towers above the Rongbuk Glacier with her characteristic jet stream plume painting a thick white line against the cold sky. ‘What was I thinking?’ I ask myself again, looking at the enormous black mountain. Soon the tents are ready for their inhabitants, and I jump into my temporary orange nylon home. I take the last Amoxicillin pill of the course, stretch out on my -40C sleeping-bag and feel at last like the expedition has really started. Due to my illness, I am much weaker than I expected to be upon arrival at the foot of Everest but that’s fine, as long as I can keep healthy for the next 50 days or so. My determination to give my all to the climb is returning as well, supported by the proximity and tangibility of my dream – Chomolungma. I am not looking forward to the first night at base camp, however, as I know I will be cold. I lie in my large, puffy sleeping bag, waiting and waiting for the down to warm up a little but the curse of my ‘eccentric’ bodily thermal regulation system is as powerful as ever, and the sleeping bag stays cold. I take an Ibuprofen to get rid of the altitude-induced headache, at least, and drift into half-sleep. When I wake up again I see someone sitting next to me in the tent, yet, I can’t make out their face, which is darker than the night around us. I wonder who my guest is, but I am more sleepy than curious, so I let my eyes close – I have a feeling I will meet my visitor again, and when I do, it won’t be in a dream but in a nightmare. SORRY!!! I promised to blog from Tibet during the Everest expedition but, unfortunately, couldn’t do it: we were experiencing some problems with communications at Base Camp, and I decided to save my thoughts about the climb for later – now. I have returned to Kathmandu earlier today and, after a couple days’ rest, will start posting the expedition story and some new poetry. Drop by if you’re curious ;)! It is early in the morning on the 22nd of March. The air is cold, and so am I. The large dining room at Dorjee’s lodge in Phakding smells of juniper and milk tea. Across the room from Dorjee and I are seated five lamas from Pema Choling Monastery. 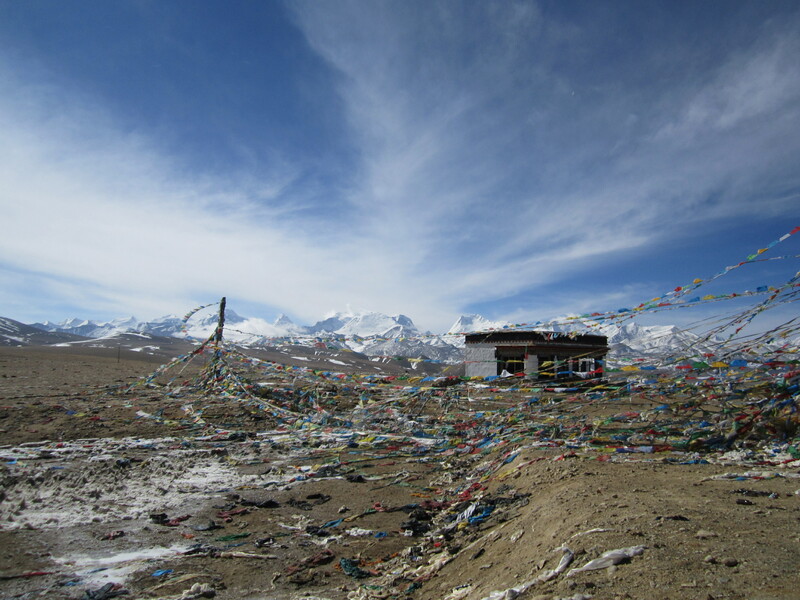 Upon our request, they have graciously agreed to come down from the gompa, perched high up on a hill above Phakding, to conduct a prayer ceremony for the Altitude Junkies’ 2012 Everest expedition. The puja, which will last all day, starts with the mantra from the Heart Sutra: Tayatha Gate Gate Paragate Parasamgate Bodhi Svaha. Gone, gone, gone beyond, gone completely beyond… No words could be more appropriate, given where we are going. As I have said in one of my previous posts, this time last year I could not imagine myself preparing to climb Everest. I loved my mountains, yes, but I couldn’t believe I would dare to step out of the comfort zone of my averageness and attempt something as big, as tough and as beautiful as a pilgrimage to Chomolungma. I think, I am a better mountaineer now than I was a year ago – although, I still don’t look like one. It is also comforting that I no longer place as much importance on my shortcomings as a climber or the lack of bulging arm muscles as I used to. My reasons for wishing to climb Everest have changed as well. It used to be about proving something to myself; it no longer is just about me. If I stand on the summit of Chomolungma, I feel, it won’t be solely to tickle my ego and become, perhaps, the first blond author of bad poetry to write her name into the Himalayan Database :). If I do reach the top of the world, it will be for the little monks of Pema Choling Monastery, – orphaned and otherwise disadvantaged boys – who reminded me that there was a big world outside myself, and that I could do something good for it. Ever since I first met the kids before leaving for Cholatse in February, I have been trying to support them as much as I could afford to. Yet, what little I have been able to donate is not nearly enough to make a real difference. Thus, I promised myself to make any mountaineering/ice-swimming challenge I may take up after the Everest expedition a charity project to provide for the improvement of the boys’ living conditions, healthcare and education. It is to the little monks of Phakding and their selfless teachers that I dedicate this upcoming climb on Chomolungma. I dedicate it also to my friends in Kathmandu and elsewhere in the world, who have always believed in me more that I have. Above all, however, I dedicate it to my mother, whose unfailing courage is the source of my own. Nevertheless, I will need more than courage and well-wishes of my friends and family, and more than mental and physical strength to succeed on Everest – I will need luck, my changeable luck, to be on my side this time. I am someone, who often requires a second chance, but Everest is not known for its generosity. So many things can go wrong, that it will take something not unlike a miracle for them not to. A lot depends on the mountain itself, and no matter how much energy I may put into the climb, Chomolungma can still destroy my wildest dream with one gust of wind. If I fail to summit, it will be very painful but not at all unexpected; if I succeed, I will be the greatest gift from the world that I could hope for. I have only one real strength: I love what I am doing, and how and why I am doing it; yet, I don’t know that that’s enough. Keep your fingers crossed for my team mates, our Sherpas and me ;)!